You need help in using the right commands on the job or in the classroom. You need a compact reference that you can take with you anywhere and find what you need quickly and easily. 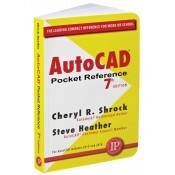 You need a reference that includes all basic AutoCAD commands and concepts. You are using AutoCAD release 2015 or later. Organized in 13 sections, this indispensable aid and handy reference is perfect for students, teachers, and all on the job AutoCAD users who are on the go and need an occasional reminder on how to use a command. This pocket reference is not intended to be a substitute for an introductory textbook. To learn AutoCAD quickly and easily, you’ll want to obtain a copy of Beginning AutoCAD Exercise Workbook by the same authors. All sections updated to reflect AutoCAD 2015/2016 styles, including all new images and many amended and new illustrations. The revised “How to …” section reflects the new methods of selecting objects in AutoCAD 2015/2016, and shows how to select status bar tools and control the display of ribbon tabs and panels. The “Dimensioning” section now reflects the new DIM command in AutoCAD 2016, which allows you to create dimensions based on the object you select. The expanded “Drawing Entities” section includes the new Revision Cloud commands in AutoCAD 2016. New appendixes have been added for metric conversion factors and frequently asked questions.